Here in the north spring is finally visible. We were in Amsterdam this weekend, experience city life and strengthen contacts, where the crocuses are in full bloom everywhere. This morning I saw in Warten the first tentative flowers along the ditch, it is clearly colder than in town. Fortunately, all the ditches are again of water and not ice and the fields are green and not wit. It's also high time to shave Panache's winter coat tough all those curls he has now look very cute. We work hard, also to be prepared for any guests, and will shortly sail away for a few days if the weather remains good. When we are not connected to shore power we need to start the generator to do jobs with electricity, so we try to do the sawing and sanding as much as possible in the harbour. Today arrives the new winch for the aftspudpole so we can use it again. As we wanted to leave our winter place for the box in the harbour we could not lift the spudpole and than you can not go far! The winch was wrong and had to be replaced. The spud pole was hoisted up with a manual hoist and secured (we absolutely need to have one of those on board, so much is clear) so we could move. When we tour around, we still like to have two spudpoles as it increases our possibilities for a nice place to more. As you can see in the picture we are away from our beautiful and we are back in a box between two other boats. When we moved to the new place we went to the bunkerstation because our diesel was low, this cold winter we burnt a lot. We had thought that from now on we can enjoy sailing and beautiful weather, nothing is further from the truth. Hard wind and rain, tant pis! We continue to work very hard, Michel started finishing the wheelhouse and I keep sanding and painting throughout. It is badly needed as there are people interested to come along for a few days so everything has to be alright. We received notice that, for next winter, a place in Haarlem has been assigned to us, in the Spaarne near the Prieel (we have yet to find out where that is exactly) in the center of town. The coming months we can consider whether we actually want to use it, we think we will. 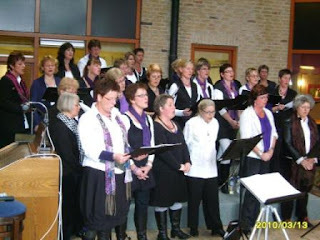 There is sufficient time to relax and see the photo for proof that I sing in a choir, last Saturday was our first performance in the retirement home in Burgum. Performing is actually different than a rehearsal and some of us were pretty nervous. We made a cabinet in the room on the short side of the kitchen. When we placed the kitchen we put no cupboard in the corner because we wanted to do that from the roomside. Now Panache decided differently because he has made the corner his own, apparently it's nice and quiet there. The days that Michel worked on the cabinet Panache was verry restless, he had lost his house and was hanging around Michel until he could go back to his pillow. There is another big advantage for him because, from the moment we have the boat, Panache was never allowed in the kitchen. From his new place he has a good vieuw not only to the room but also, through the back door, in the kitchen. In the kitchen all the old bathroom tiles have been used and the new cabinettop is the pink marble from the original rear cabin, slowly but surely we get trough our materials. We have one sliding door left that w'll put between the hall and the lounge. Most of the ice has melted now. Because of the strong wind, or rather storm, the last days the water in the canal along the ship has, unexpectedly quickly, melted. The ducks are swimming around again. The harbour entrance is ice free only in the harbour is still a, thin, layer of ice. The harbourmaster has already notified us that, as soon as possible, we have to leave our beautiful spot for a box inside the harbour. Helas, but the other side is that now we can sail (when it's slightly less windy). Until mid april, we have our base here and then we will move on. So there will be some more hard work, to get everything in order.